The propaganda about a hot economy, “overheated” housing market and tight labor market is just one of several Big Lies being promoted by politicians and business leaders. The article below references a comment made by a money manager about the housing market “overheating.” But the housing market isn’t overheating. 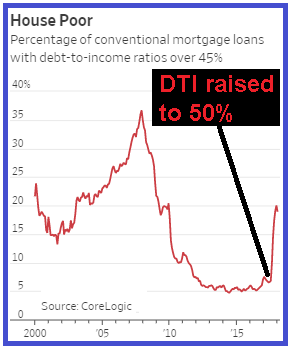 What’s overheating is the amount of “conforming” mortgage debt underwritten by the Federal Government on behalf of taxpayer. I’ll have more to say about this tomorrow. The transformation of Fannie Mae, Freddie Mac, the FHA and the VHA into the new subprime debt provider has caused a shortage of homes under $500k, or under $600k in “high price” zones. But there’s an oversupply of homes north of $700k in most areas (the Silicon Valley area notwithstanding). But more on this tomorrow. A colleague and email acquaintance, Aaron Layman, is a realtor in Houston who has been uniquely outspoken about the degree to which the current housing market is unhealthy and dysfunctional. I say “uniquely” because 99.9% of all realtors would sell a roach motel trap to cockroaches if they knew that they could get the cockroach qualified for a Taxpayer-backed mortgage to make that particular purchase (“hey man, this is a good value and prices are only going higher”). If you are out shopping for a home during this summer selling season and you are having a difficult time finding a good property at a reasonable price, be sure to thank the folks at the Fed for their fine work. Destroying a market takes some effort, particularly if you account for all of the PR necessary to cover your tracks. The Federal Reserve and their army of economists have created another fine mess in the U.S. housing market, destroying real price discovery and distorting the real value of a home which is end-user shelter.